Some of you know for the past year, I am peri-menopausal. The hot flashes come occasionally, but it really does not bother me that much. What has, and does, bother me is how my body feels. Some days, I can honestly say that my body is not mine. I seem more prone to injury; sometimes not even knowing what I have actually done to cause the injury. My body composition is shifting, and my fitness levels to some degree. Now, I can cope with the occasional hot flash, because it is just that …. it is gone in a flash. The rest of it, so far, leaves me in unmapped territory. I have always used my body. Throughout my teens and even through university, I trained and competed in various sports. As a teenager, it was softball and martial arts. At university, it was yoga, martial arts and women’s rugby. Upon leaving university, I started working in the fitness industry and so I carried on using my body for my job. Now, in my mid-forties, I seem to be losing my ability to predict how my body will react at any given time. When I get over an injury, something else appears. 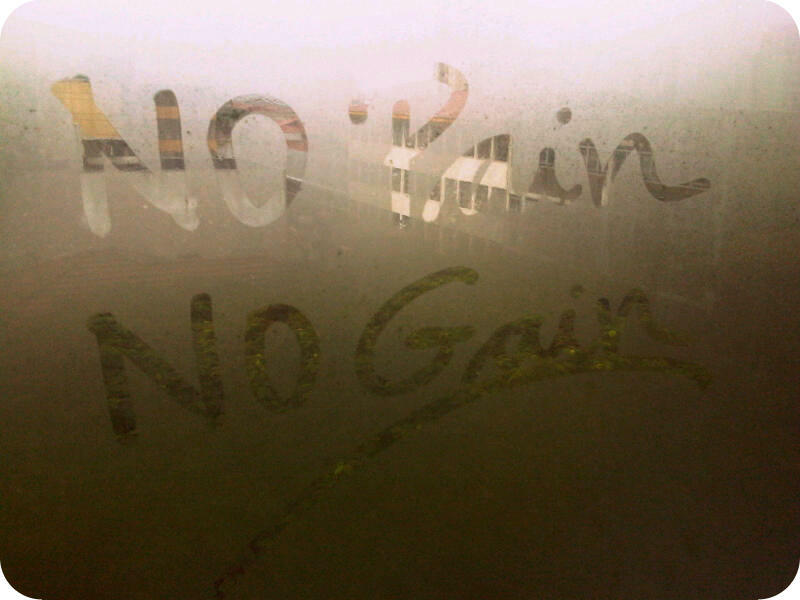 No pain, no gain …. hmmmmm. So I am now surrendering to this process, as challenging as it is mentally for me. It is part of being a woman and it is an element of the process of life. It is part of ageing, and I intend to do so gracefully. Rather than dismiss the sensations, hope that they will go away and plough through my training and yoga practice, I need to accept the present moment and listen to my body; listen closely enough so I can act with foresight, rather than hindsight. And, this means I have to take a more humble attitude towards myself; to be completely mindful and respectful of my body. I need to become a beginner again. An opportunity to awaken new way to my Yoga practice, my training, my body, my Self. An opportunity to move forwards in life. Have you gone through this period of your life? Are you currently going through it as I am? Been through it and out the other end and feel all the better for it! Look at the positives – no more hormonal mood swings and chocolate cravings (although I do still enjoy chocolate! ), no more worries about unplanned pregnancies, no more period pains! Being physically active helped me through my menopause – a fit and healthy body copes so much better with any challenge. Yes, I sometimes feel aches and pains a little more than it used to, but I learned to listen to my body, respect what it was telling me and work with it, which helped me develop a deeper understanding of myself, my capabilities and my limitations. With that self-knowledge comes a growing sense of confidence and self-belief. They don’t call it ‘The Change’ for nothing, and I feel my life has definitely changed for the better! Thanks, Steph. Yes, definitely listening & respecting my body more these days. See you soon! 1) As you know the latest BodyBalance release has a focus around acceptance. Your words here have really helped me to find my own connection to acceptance and to articulate this in class. Seems to be being well received too. 2) My own yoga practice. I’ve never really managed to perform my own practice other than going to classes (which for me has been about learning, improving technique and ‘borrowing’ coaching points etc) or practicing BodyBalance releases. But your comments about your own practice (in this post and others) has meant I now stick on some of my favourite non-yoga music, grab my mat and go though whatever poses I feel like. Loving this alone time! Great post Ann-See – thank you. My experience is obviously a little different but this post has really helped me to connect with the acceptance focus in the new bodybalance release. I was struggling to connect with the focus and articulate/express it in class – but your words here have really helped – and my participants seem to be appreciating it too.